The scenery around Walla Walla was more beautiful than I had anticipated. Last week found Jeanne & me happily taking a couple of days off of work to drive out to Walla Walla wine country. It’s a trip that we’ve been trying to fit in for a couple of years now, and we just kept putting it off. Now, you all know my preference in alcoholic beverages….but, I also really enjoy a good glass of wine. With something like a gazillion wineries in the Walla Walla area, a good glass of wine isn’t exactly hard to find. Luckily for me, a good glass of beer wasn’t hard to find either. A wine appreciation course that I took at Purdue (taught by the appropriately named American Airlines Wine Consultant, Dr. Richard Vine) probably helped lay the groundwork for the beer geek I am today more than I know. About 300 of us students would get together in a lecture hall at Purdue on Monday nights to listen to Dr. Vine’s lectures for 90 minutes (mostly just slides and stories from his vacations to wineries around the world), and then we’d taste and evaluate various wines over the last 90 minutes of the class (which usually included a spread of nice cheese/crackers, etc…). We had the opportunity to taste some great wines well beyond the means of a typical college student, thanks to the gratitude of American Airlines. While I still enjoy wine today, I don’t really evaluate it as I do beer anymore. But, that class at Purdue was my first intro into how to think about what I am drinking and evaluate it, which has carried over nicely to the world of beer. Anyways, back to the trip. While the focus was definitely wine, you know Jeanne and I are going to find a way to work in some beer on any trip. Our first stop was on the drive out at Rattlesnake Mountain Brewery in Richland, WA. I was really hoping to go by Ice Harbor, but our timing didn’t work out on this Sunday night. I had just tried Rattlesnake’s Smoked Porter at the Naked City Anniversary, and I wanted to give it another chance. A sample at the bar told pretty much the same story as before; under-carbonated, not very smoky, and a little cola-like. A schooner of their IPA revealed similar carbonation issues. My glass was filled to the rim, and there was no head or bubbles to be found. Jeanne’s pint of their Honey Red was a winner, though, and we grabbed a growler of the lightly sweet red ale for later that night. As far as the place itself, it’s a pretty cool bar with good food that was perfect for watching a little of the World Series combined with Sunday night football. There are several breweries around Walla Walla, but our timing was such that we were only able to make it to Mill Creek for a pint before dinner on Monday. They have a few house beers, but their tap handles are outnumbered by mediocre guest taps…if that tells you anything. I do have to say the two house beers we tried (IPA and Oktoberfest) were at least solid. I was really hoping to head to Laht Neppur Brewing in nearby Waisburg, but they sadly do not open on Monday and we were leaving before they were open on Tuesday. Similarly, we ended up touring a few wineries out near the location of Walla Walla Brewers, but timing didn’t work out there either. We did at least head to a local bar (at the advice of a couple of people at the wineries) called the Green Lantern, where we grabbed a pint of the Walla Walla IPA. If you haven’t had it, it’s a very solid IPA. According to a kind gentleman working at the Merchants Deli in downtown Walla Walla (where you’ll find the best craft beer bottle selection in the area), Walla Walla Brewers will soon be sending bottles and kegs of their beer over the mountains to us Westerners. So, keep your eyes out for them sometime soon. 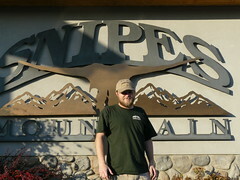 The beer highlight of this excursion was definitely our stop at Snipes Mountain Brewing in Sunnyside (Yakima) on our drive home. Chris Miller at Snipes is making some great beers and it was a pleasure to make it out there. I had contacted him ahead of time because I was slated to do an interview with him for the NW Brewing News, and he kindly showed us a great visit and spent a couple of hours hanging out with Jeanne and me. I’ve always been a fan of Snipes beers, especially their IPA and Porter. Their Coyote Moon just won a Bronze Medal at GABF in the British Mild category, and Chris just snagged first place at the Yakima Fresh Hop Festival with his Harvest Ale as well. I hadn’t had the Coyote Moon in quite a while, but it really is a fantastic session beer. At 3.9% ABV, it still manages to pack in plenty of taste. We also tried a couple fresh hop beers made with experimental hops straight from the tanks/fermenters, as well as a new English-style Longhorn IPA that seemed ready to be served soon. Based on what I’ve tasted from Chris, he is quickly becoming the master of hops. Another highlight was a hoppy Double IPA that was as sneaky as can be with its ABV…dangerous. Check out the “Mugshots” section of the upcoming December/January issue of the NW Brewing News for a more complete story on Chris and his beers. L’Ecole – One of our favorites and the first we checked out. Great wine and nice tasting room. Buty – Right next to Walla Walla Breweries. The wine we sampled was pretty amazing, but we weren’t exactly welcomed with open arms here. Felt a little “snobby” and just really awkward; the woman didn’t seem to want us there. Trust – This place rocked. Ex-CNN journalist who moved to Walla Walla to run a winery. Nicest guy ever who was the only person of the trip that offered to show us around the entire operation. Very solid wines. 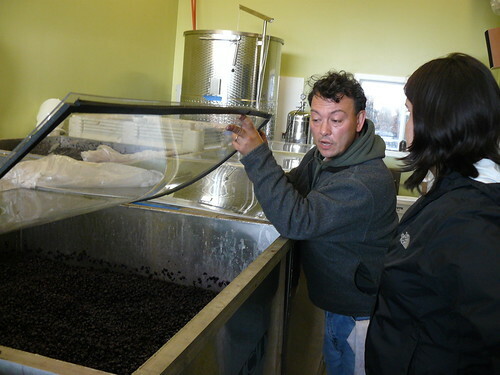 Saviah – Makers of “The Jack”; the wine you’ll most often find in our glass at home. Great guys and great wines. They were also kind enough to draw us a map to a place we could get a headlight replaced! Cougar Crest – Really nice tasting room, and solid wines. Reininger – Probably one of our two favorites from the trip. We picked up a couple different things here. Dusted Valley – Solid wines, and a very freindly experience. Woodward Canyon – Our other favorite from the trip. Located right next to L’Ecole. Fantastic wines, plus an affordable second label. Dunham Cellars – The busiest winery we visited, and probably the one whose wine impressed us the least. Still solid though (these were all visit-worthy places). Gifford Hirlinger – Nice place, but only pouring two wines. Did get a bottle of their Merlot they were unloading at 50% off. You can see the rest of our photos from this trip here. Steve Brooks of Trust explains things to us novices. Nice story Geoff. Kendall and I made a similar trip in early August. I’m a huge Chris Miller fan. Next time, if you haven’t tried Whitstran in Prosser that’s definitely worth a stop. They used to have only a tasting room, but now they have a full brewpub. See you at WABL this Saturday? See you Saturday…it’s gonna be a good one! When I was in Walla Walla I liked the Penitentiary Porter at Mill Creek. I’m not a beer fan but I liked it (which may not be a ringing endorsement). Live in Wa. since 1968. Read a couple book written by Timothy Egen with Wa. History. Walla Walla was the town back during no booze/depression period,trains coming & going. Now I will go & check it out. During spring break! Speaking of this Saturday, if you guys know anyone (has to include at least one WABL Member) who wants a couple of tickets, ours are available. We won’t be able to attend, leaving town on Saturday due to family matters. Absolutely second Whitstran! Big bonus – they are located in a “strip mall” of wine tasting rooms, which include the always fabulous Heaven’s Cave Winery, one of my personal favorites in Washington State. Yours are suggestions best delivered in a personal e-mail. Bill – I’m definitely a beer drinker first and a writer second (or third, considering it’s not my day job); I’m still learning as I go along. Thanks for the advice, and I’ll make some changes. This was a combination of not editing myself and being in a hurry. I should know better with the who’s vs. whose. But, I’ll admit the I vs. me probably slips past fairly often when there is another name involved (I’m always thinking “Jeanne & I”, etc..). For the record, I do not make any money off this site at this point. I make some money via NW Brewing News and freelance, but nothing here. You mean I’m not gonna make any money out of this whole beer blogging thing? Damn…I’m so disillusioned. I have to rethink everything now. Geoff and readers: be sure to visit Prosser’s newest brewery Horse Heaven Hills! hrs and location at the link above. NOTE: the Whitstran Brewing Co production facility (and former tasting room) is ONLY OPEN for tasting on SATurday’s. Visit their brew pub in historic downtown, open daily. Enjoyable article. I do hope you get a chance to visit Waitsburg and Laht Neppur (the Ruppenthal’s are great folks with a great product). Also, you have to hit the Whetstone Public House when you are in town. It is a beuatiful pub and definitely worth dropping in for a beer. Also hit the Whoopem Up Hollow Cafe for some great Southern fare and Jim German’s for a great signature cocktail. Beautiful little town, friendly folks — Waitsburg is a day well spent! I was pretty excited and killed the keg of Snipes and put a good dent in the Irish Death over the next few days. I even got a few of my BMC friends to try the Blonde and they really liked it.